In existence for over 30 years, dental veneers are still not commonly understood or utilized by many dental patients in Langley, BC. While most people have heard of whitening teeth with bleach treatments, they are not aware that they are being exposed to the bleaching alternative almost daily. In fact, dental veneers are worn by actors, models and professionals and play a huge roll in the cosmetic dentistry industry. Dental veneers are similar to acrylic fingernails, where a replacement is shaped and placed on the natural nail. Veneers are made of a thin layer of custom-made porcelain or composite material, which are then placed over the natural tooth. However, unlike an acrylic nail, veneers are incredibly tough. Patients with dental veneers are still able to bite into carrots, eat fudge, or enjoy anything else they would normally. Dental veneers are completely sealed against the natural tooth, lasting for several years without regular maintenance. While professional teeth whitening may have a few limitations, veneers are used to solve a variety of oral health issues. Bleaching is typically used only to lighten teeth, without the ability to change the position, size or shape of teeth. Dental veneers do more than just make your smile look beautiful, they can also help fix for biting problems, help fill in gaps between teeth, or straighten overlapping teeth. Dental veneers also allow you to keep much of your natural tooth, which is always ideal. Veneers are custom-made to cover just the front and biting surface of your teeth, which leaves the back area untouched. 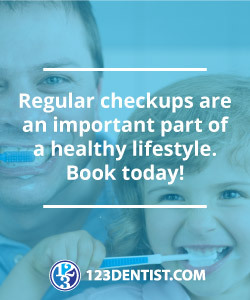 Don’t forget, if you are interested in any cosmetic dentistry solutions from Thunderbird Dental Group it is incredibly important to maintain proper oral health. For more information on dental veneers, or to book an appointment at our Langley dental clinic, contact us today!